A while back, I walked into one of those store front psychics in the East Village, advertising ten dollar readings. Before entering, I gave my wallet to a friend, who waited outside, judging me for wasting my hard earned cash. I carried in with me only a ten dollar bill with which I was willing to part on a lark. I'd visited one such psychic years earlier in the West Village and nothing she told me came true. I thought maybe since this psychic was in the East Village, her extra sensory perception was better tuned into the world of precognition and not muddied by the overt commercialism of Western society. Idiotic? Maybe. Moronic? Definitely. I was expecting a bosomy woman in her sixties wearing too much makeup and smelling of stale cigarette smoke to greet me with a "Velcome, dahling" when I opened the door, thinking all psychics looked, smelled and sounded like the first Romani fortune teller I'd gone to. Instead, a rather athletic, pretty woman in her late twenties, whose scent was of a sweet, flowery perfume, came to the front of the store as I entered. She read my palm for maybe five minutes and told me that my bed was slanted: true, I would have an issue with one of my knees: also true, and a few other generic things that turned out to be true, but really could have applied to anyone: I was going to sign some important papers, someone was jealous of me, etc. She kept her predictions just vague enough to try and tempt me with a forty dollar tarot reading, which would explain everything in greater detail. I thanked her for her reading and told her maybe I'd come back another time for the more comprehensive reading. If I were less cynical, I could see myself going back, making weekly, even daily appointments, each time stopping off first at the ATM before seeing her. Eventually, she'd have me carrying around a Ziploc bag full of some holy man's pubic hair that would ward off evil spirits and that she'd sell me at a discount because I was such a good client. I still think about going back in whenever I walk by her store, but the only short and curlies I'm willing to carry on me are my own. She did give me an idea for a short story, though. 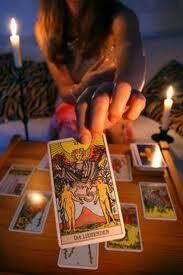 You can read it here: "The Tarot Reader."